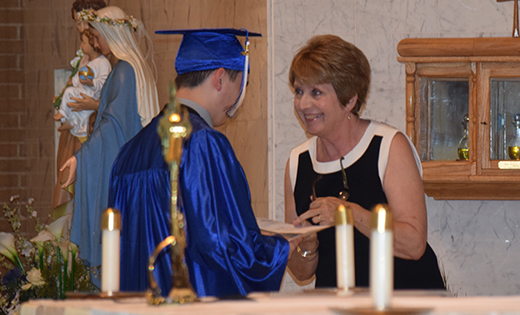 Eighth grade ended on a high note for Samuel Bachinsky, winner of the 2018 Young Catholic Leader award. Sam graduated from Saint Mary School in East Vineland and will begin high school at Saint Joseph in Hammonton. He joins a list of Catholic scholars who have won the award established in memory of Dr. David T. Coghlan, life-long Catholic school educator and former superintendent of schools in the Diocese of Camden. Diagnosed with cerebral palsy at age 2, Sam has never let his disability get in the way of his dreams. Acknowledging his physical limitations, he credits his mother’s refusal to accept a dire prognosis as the catalyst for his success. “It is because of my mother’s determination and the choices and sacrifices she made for me that today I am a ‘normal’ kid, who can walk, swim, go to ‘normal’ school,” wrote Sam in his competition essay. In memory of her husband, Dr. David T. Coghlan, Kathy Coghlan presents the 2018 Young Catholic Leader award to Samuel Bachinsky. A recent graduate of Saint Mary School in East Vineland, Sam will attend Saint Joseph High School in Hammonton. Hogan said Sam shines most in the way he volunteers his time — at school, in his parish, Our Lady of the Blessed Sacrament, and in his community. The Coghlan Scholarship Committee reported an exceptionally high caliber of submissions from 24 Catholic elementary schools for this year’s award. In addition to Sam’s $1,000 scholarship, two runners up were awarded $500 each. They are Devin Hughes from Resurrection Catholic School in Cherry Hill, who will attend Camden Catholic High School, and Anthony J. Fucci, a Cape Trinity Catholic School graduate who will attend Wildwood Catholic High School. Every nominee received a $25 Barnes and Noble gift card.